It was not until I was older that I had the chance to experience all three of these so-called “garbage fish” and I found them to be exceptionally tasty. I had no idea skate was an edible fish until I entered the culinary industry and began trying different cuisines. I first tried it in a local Italian restaurant and loved it! I vowed that the next time I caught one while fishing I would bring it home and give it a go myself. 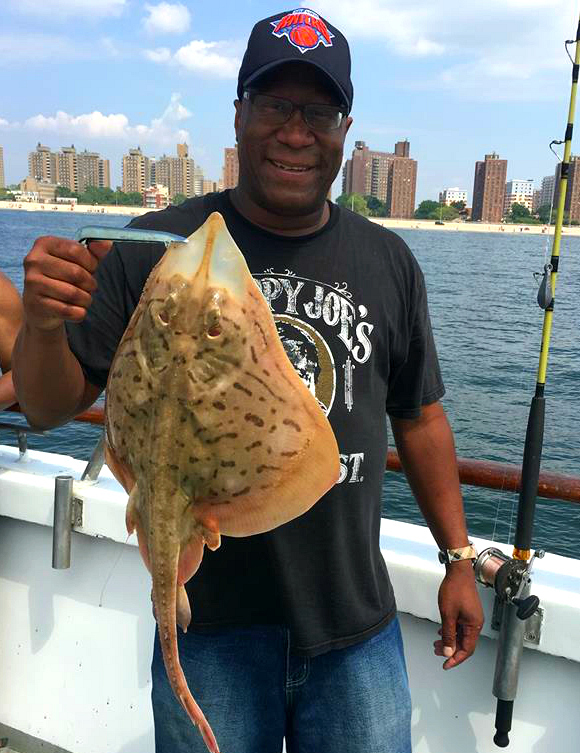 So while fishing off the shores of Coney Island for fluke, I managed to bag a spiny skate. Skates and rays are part of the shark family and have pectoral fins so exaggerated they are called “wings”. This allows them to lie flat on the ocean floor and disappear into the sand. They eat mainly crustaceans and other invertebrates they find on the ocean floor, but occasionally take small fish which was what I used to catch this one. Here is a WARNING before trying to clean a skate or ray ; most of these fish have very rough hides with spines, small and large, so use extreme care when cleaning these fish and use a very sharp knife and a pair of pliers (for pulling the skin off). Additionally, filet your fish very soon after catching (within 6 hours) since it releases ammonia after its dead. If your fish smells like this, it is no longer fresh and you should discard it. 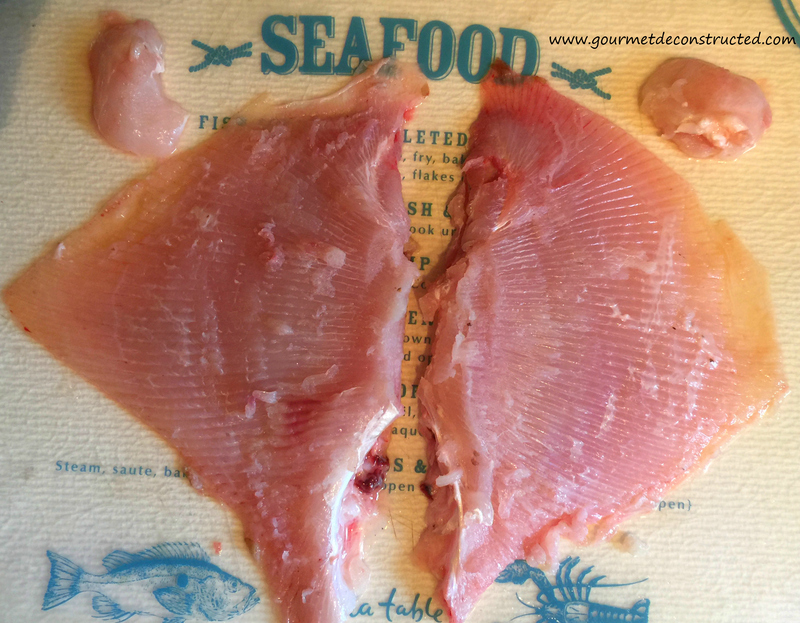 I highly recommend that if you are not sure you are able to clean a skate or ray properly, please throw it back into the ocean shortly after catching it and check your local fish market since they may sell the wings already skinned and cleaned. Sea Robin caught and cooked! I must have watched a dozen different web videos on how to properly clean this fish and I think did a pretty good job, I even removed the cheeks which turned into a great little treat after a quick pan sear. I was poked a few times by the spines, but nothing too serious. After some research I learned the fish went well with lemon and capers so I decided to try a Grenoble sauce. The end result was a fish that was mild and meaty, and very delicate when cooked correctly. So if you ever have the opportunity to try skate, I say give it a whirl. Season the skate with salt and pepper. Season the flour with salt and pepper. Dredge the skate in the flour, coating completely. In a large sauté pan, over medium heat, add the oil. When the oil is smoking hot, sauté the skate for 2 to 3 minutes on each side. Remove the fish from the pan and set aside. Add the shallots and capers. Season with pepper. Sauté for 1 minute. Add the lemon juice and wine. Bring the liquid to a boil. Reduce the heat to medium low and simmer until the liquid reduces by half, about 6 to 8 minutes. Whisk in the cold butter, a cube at a time. Season with salt and pepper. Stir in 1 tablespoon of parsley. Add the fish back into the sauce and simmer for 2 to 3 minutes. 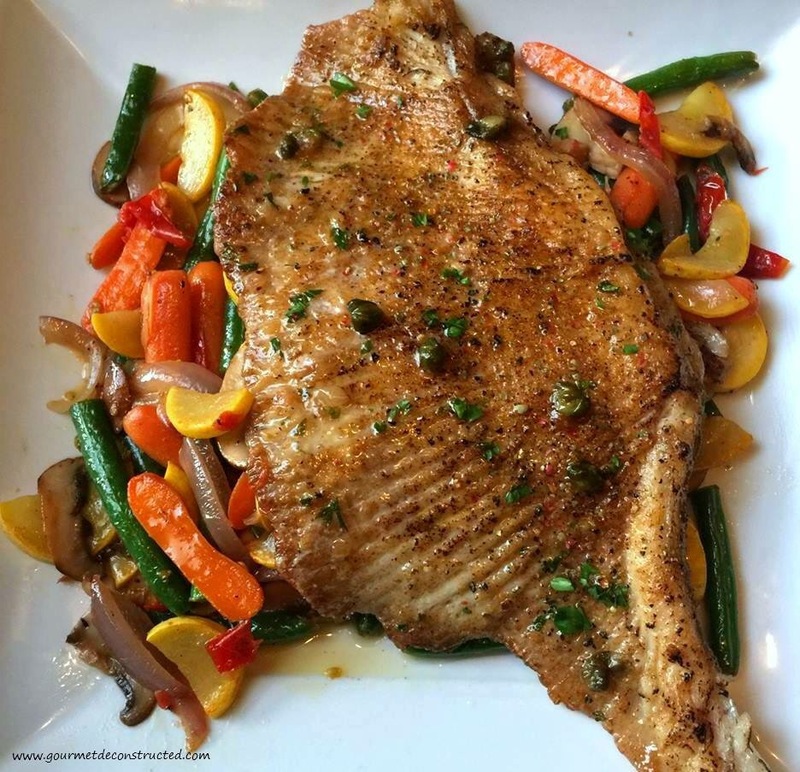 Remove from heat and serve topped with capers and sauce and use the side of your choice. I sautéed some mixed vegetables to accompany the fish. Bon Appetit! 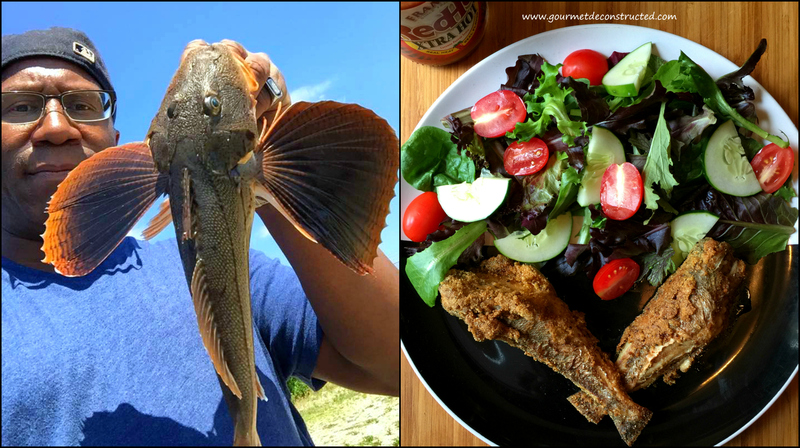 Posted on July 9, 2016, in Foodie Road Trips & Other Fun Things, Seafood, Wild Game and tagged à la Grenobloise, butter, capers, coney island, fishing, grenoble sauce, lemons, sea robin, seafood, shark, skate fish, skate wings, stingray, white wine, wild game. Bookmark the permalink. 4 Comments. Good stuff as usual Chef! I’ve never had the pleasure of eating this nor would have tried it up until now! Thanks for sharing! Looking forward to one day throwing down in the kitchen with you! You definitely inspire! Well done! 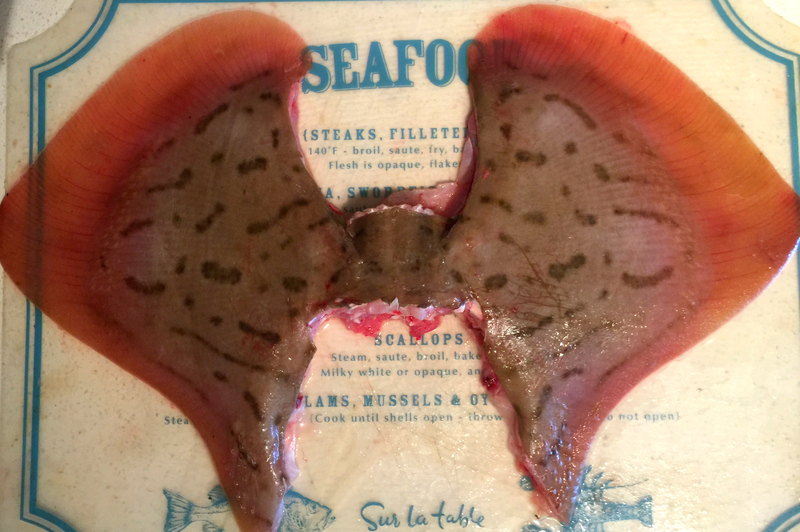 I catch stingray down here on the Texas coast, and recently tried Anthony Bourdain’s skate grenobloise recipe from his Les Halles cookbook. Always considered them a nuisance fish until I did that, now I’l be happy every time I catch one. Nice searobin! I’ve never caught one big enough to do anything with, but I’ve been curious to try gurnard recipes I’ve seen in cookbooks printed in Europe.